Pioneering Conwy fire safety scheme hailed a life-saver by expert | News by Wales Express News, People Before Profit! Safe and Well , Cartrefi Conwy staff recieve training from North Wales Fire and Rescue; Pictured is Chad Rogerson from NWFRS with James Wood, Housing management trainee and Nia Williams, Customer serv. According to Cartrefi Conwy, it has already helped avoid a host of potential fires by highlighting properties packed full of combustible items such as old newspapers and junk mail. As well as posing a risk to tenants, they warned that hoarding could also endanger the lives of visiting support staff and the emergency services in the event of a blaze. 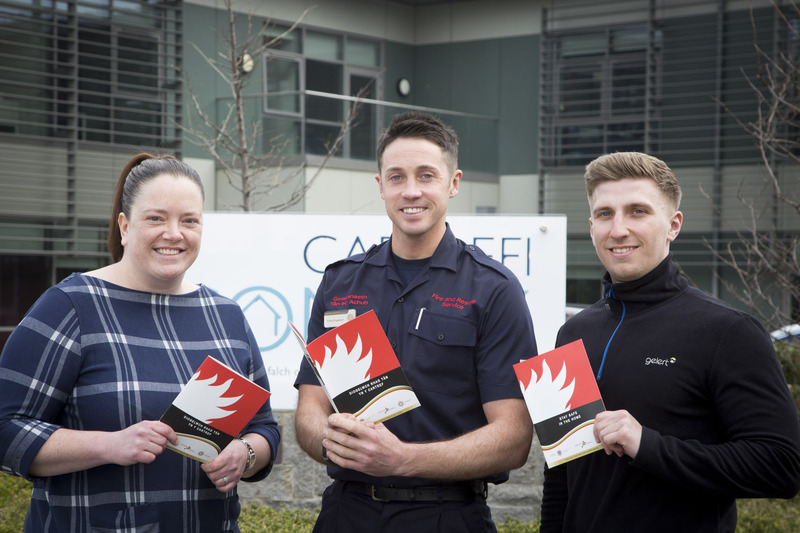 The Safe and Wellbeing scheme launched by Cartrefi Conwy in partnership with North Wales Fire & Rescue Service is the first of its kind in Wales and is celebrating its fourth anniversary. In that time more than 1,000 checks have been carried out at Cartrefi Conwy’s properties across the county. Cartrefi Conwy have introduced specially trained Home Partners who visit tenants’ homes at the same time as gas engineers when they are carrying out annual gas safety checks. During these visits they have been trained to identify any potential safety risks that could lead to a fire or cause harm to vulnerable residents through the risk of slips, trips and falls. Any issues are reported back to Cartrefi Conwy’s managers who review and take steps to put things right. Chad Rogerson, partnership manager at North Wales Fire and Rescue Service for Conwy and Denbighshire, worked with them to set up the scheme. He said: “It’s been a potential lifesaver from day one. “The scheme, which is joint funded by North Wales Fire & Rescue Service and Cartrefi Conwy, is unique in Wales and is extremely valuable in that it provides the opportunity to engage with the most vulnerable people within the community. 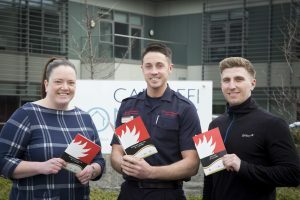 “This unique partnership gives North Wales Fire & Rescue Service huge assurance in the way Cartrefi Conwy approaches the importance of the wellbeing, safety and security of their tenants. “I know that in some cases these home assessments have prevented serious harm and potentially saved lives. “Hoarding by tenants is not only a fire hazard to themselves and neighbouring homes but also puts the lives of support and emergency staff at risk. “The scheme has major advantages for both organisations and the community. We are able to liaise directly with tenants in their homes, identify any concerns for safety and wellbeing, and take appropriate action to improve safety for all concerned. “Since the partnership started over 1,000 Safe and Well checks have been carried out at Cartrefi Conwy’s 3,800 properties across the Conwy County. A third has been in sheltered accommodation that often houses older and more vulnerable tenants. “The Home Partners, are trained and assessed by North Wales Fire & Rescue Service to give general advice on safety and wellbeing topics including weekly testing of smoke detectors, escape plans, night time routine, chip pan and cooking advice, smoking, candles, open fires and electrical and gas safety advice. “During visits they often identify people who are statistically at increased risk to fire, including the elderly, physically impaired, those with drug or alcohol dependencies, those who are subject to visual or hearing impairments or just living alone. “North Wales Fire & Rescue Service have trained nine other Cartrefi Conwy colleagues. These include Independent Living Coordinators, Tenant Liaison Officers and Customer Services Advisers. “I’m truly delighted to have the Cartrefi Conwy Home Partners and Cartrefi Conwy Colleagues on-board with this project. “This is a fantastic example of a great working partnership, it’s a proud privilege to be a part of its success. Carol Richards has been seconded by the fire service to work as a Home Safety Support Worker at Cartrefi Conwy. She said: “In one property we identified a large number of electrical extension cables leading from a single plug socket in one room into the adjacent kitchen with daisy chain of connections. “This not only raised concerns for the obvious electrical safety issues, but also put the elderly tenants at risk of slips, trips and falls form the trailing leads. “Due to the opportunity of being able to talk to the tenants and with support from Cartrefi Conwy colleagues we were able to solve the problem safely and effectively. “Home Partners can also refer any other issues tenants might be facing with other local authority social support services or agencies dealing with matters such as benefits and welfare rights. “Having a housing association working in partnership with the fire service in this way is unique and I’m pleased to be part of the scheme. Two new Home Partners who are currently undergoing training say they are proud to be taking on their new responsibilities. Cartrefi Conwy’s James Wood, has spent 18 months as a neighbourhood management trainee with Cartrefi Conwy before switching roles. He said: “I’m looking forward to the chance of getting out there and meeting people in their homes and helping them with any problems they might have. His new colleague as a Home Partner is Nia Williams. She said: “I’ve been working in customer services for Cartrefi Conwy for two and a half years which was all about helping people. That was mainly over the phone but now I’ll be meeting them face to face. “The training has been really thorough and I’m looking forward to helping people with lots of things apart from safety matters and that includes pointing them in the right direction to get expert advice on benefits.